Imagine you have just entered a fairytale land with a beautiful canopy of 100 foot trees, rustling ferns, an ocean breeze and the only sounds are the leaves softly blowing in the wind and an occasional owl hooting in the distance at night. You have arrived at the WildSpring Guest Habitat in Port Orford, Oregon. This place to me was almost beyond words. You have to see it to believe it. WildSpring is a small, eco-friendly resort 60 miles north of California. Private and secluded, on five acres of a lovely residential forest, a bluff overlooking the ocean, with a zero carbon footprint, it offers comfortable luxury in a naturally beautiful environment. 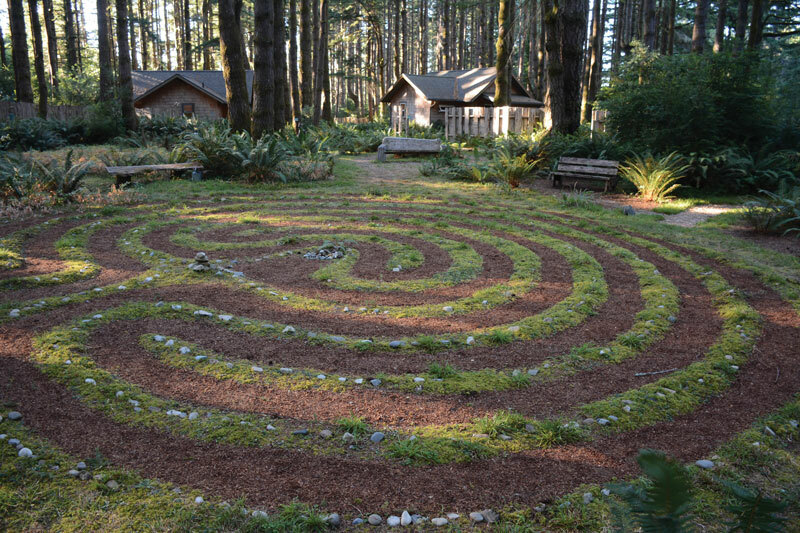 From here, you can explore Oregon’s spectacular South coast or you may not ever want to leave WildSpring! In which case there are art galleries, a lighthouse and a few restaurants in town to investigate. During the day, you can walk the labyrinth in the forest or just find a hammock and read. At night, float in the open-air slate spa, listen to the surf and watch the Milky Way. This place is pure relaxation. When you arrive at WildSpring, you retrieve your Registration packet and information for the keyless deadbolt lock on your cabin from a mailbox at the parking area (or you can call on the intercom for help to the cabin if you wish) – you can’t get more privacy than that. There are only five cabin suites and each are built like small homes, with radiant-heated floors, vaulted ceilings, and separate sleeping and living areas that can be divided by pocket doors. They’re nestled in the forest about 50 to 100 feet apart, with greenery and artistic fence sections placed to ensure privacy. Each cabin is filled with artwork, antique and vintage furniture, luxury towels, spa robes and lush chenille throws. You’ll also be delighted to find a refrigerator, massage table, a 28″ LED TV/DVD combo, Sony CD/iPod stereo, a special WildSpring CD, wine glasses and cork screw, hiking guide, candles and lighter. The large cabin, Annwyn, has a lovely old Vermont Castings woodburning stove, is already set up to light, and all your wood and starters are provided. The bathrooms are works of art with oversized walk-in slate showers, brushed nickel fixtures and natural Gilchrist & Soames bodycare amenities. The owners, Dean and Michelle Duarte, spent many years looking for the perfect place to build WildSpring, and there is no doubt they found it! For years before opening to the public, the house on the property that they currently reside in was rented to Tibetan Monks as a vacation rental before they moved here – and you can feel the sacred energy that still runs through the property. It is truly a blessed place. The intent at WildSpring is to remove you from the interruptions and distractions of your daily life and provide a serene place to heal, relax and renew your body and soul. The Guest Hall overlooks the ocean with radiant heating and floor-to-ceiling windows and, along with the expansive deck, tends to be the favorite guest hang-out area…a perfect place to eat, read, play games and whale watch. This is where breakfast is enjoyed every morning and it’s unlocked all the time so you can always make yourself a cup of coffee or tea, pop yourself some popcorn for a movie in your cabin or grab some chocolates. The spacious open-air, slate hot-tub/spa is the only one of its kind in the south coast. It is in a glade surrounded by 100 foot trees overlooking the ocean. Large and comfortable, it’s four feet deep in the center and it’s built high enough above ground to enable you to sit and watch the ocean while soaking up to your chin in steaming water. The property itself is strangely protected from the famous Port Orford winds – imagine the surreal experience of looking out at a sea whipped by 80 mph winds while your hair is barely ruffled. Probably the most wonderful aspect of WildSpring is the artwork. As you wander the grounds, you will find some amazing sculptures…. some playful, some profound… some larger than life, some tucked away in the ferns that only reveal themselves after they see you walk by a few times. As I was strolling through the property, I came around the edge of the pasture and looked up to find an 8-foot sculpture of the “Shaman of the Benediction” by artist Bill Worrell. My jaw dropped because not only do you rarely see his pieces (I found his work in a gallery in Sedona and was fortunate to purchase a small sculpture entitled, “Invisible Forces”), but to come face to face with a larger than life size one will take your breath away. As for being ecofriendly – they went above and beyond! WildSpring used responsible local contractors who understood the need to be kind to the land within their own community. They were able to place the cabins and dig deep enough for the infrastructure while only removing two living trees during the entire development. All the cleaning products are nontoxic, pH-neutral and scent-free. All the appliances are low energy and low-flow, and they use low-watt and energy-efficient and CFL bulbs inside whenever possible. There are containers to collect water and greenery was planted that is a natural source of food for the gentle wildlife. In addition, they buy local and organic produce and flowers whenever possible. WildSpring is truly a magical place that you have to see to believe! On our trip down to Port Orford, we got to experience some of Oregon’s finest wineries that produce what some consider the world’s best Pinot Noir. We toured Vista Hills, Archery Summit, Sokol Blosser and JK Carnere. Our first stop was Vista Hills which produces small-batch estate Pinot Noir and Pinot Gris high atop the storied Dundee Hills. The Dundee Hills AVA is situated in the northern stretch of Oregon’s famous and fertile Willamette Valley. While total production is around 3,500 cases per year, many of the wines are produced in micro-batches of 100-200 cases. A variety of clones and variations in vine age and exposure allow for a broad spectrum of flavor within a single varietal. The 2013 Pinot Gris and 2012 Pinot Gris Rose were delicious along with a beautiful 2010 Pinot Noir. For more information, http://www.vistahillsvineyard.com/index.htm. The next stop brought us to Archery Summit Vineyard. When Wine Spectator and Wine Enthusiast award 7 of your wines at 90 points or higher, you know you’ve got amazing wine! Archery Summit pioneered the gravity-flow system of winemaking, eliminating the need for mechanical pumps used to transport must and wine among fermentors, tanks and barrels. The design utilizes five levels: grapes received at the crush pad on the top level travel downward, one floor at a time, to the fermentation hall, aging caves and bottling area. By using an elevator built into the cellar 60 feet below ground, barrels can be lifted for racking and blending and filled without the use of pumps. This process prevents any stress on the wine that might impair its essence. With a grape as delicate as Pinot Noir, this is imperative. My favorites were the 2013 Looney Vineyard Pinot Noir which opens expansively and expressively with lifted aromas of fresh blueberry, crushed mulberry, grenadine, and a hint of crushed stone. The 2015 Vireton Rose was exceptional too. Brilliant watermelon in color, it tantalizes with aromas of fresh cranberry and candied orange peel. For more information, www.archerysummit.com. Next up was Sokol Blosser Vineyard. 1970 was winding down when founders, Bill Blosser and Susan Sokol Blosser pulled their ’68 VW Camper up to an abandoned prune orchard some 30 miles southwest of Portland. These moonstruck kids had little farming experience and just a basic knowledge of winemaking. What they did have, in abundance, was a passion for growing the Pinot Noir grape and creating world-class wine. To thrive, the Pinot Noir grape needs a particular climate found in Burgundy, France and, coincidentally, where the 85-acre Sokol Blosser estate resides in the Dundee Hills of Oregon. Higher elevation, warmer nighttime temperatures and less low-elevation fog help protect the grapes in the iron-rich, fertile and well-drained red Jory soil of the Dundee Hills. For Pinot Noir to become a world-class wine there must be a level of care and commitment that goes beyond that of any other varietal. At Sokol Blosser that includes careful hand harvesting, fermentation in small lots and aging 16 months in French oak. They hand sort through every grape before it goes into a fermenter – for Pinot Noir, the grapes are de-stemmed without crushing, to preserve as many whole berries as possible. And they’re ecofriendly! In fact, in 2002 Sokol Blosser became the first US winery to receive LEED Certification. My favorites were the 2013 Dundee Hills Pinot Noir which exhibited dark fruit flavors of cherry and blueberry with earthy and spicy characteristics. I also loved the 2012 Goosepen Block Pinot Noir which had notes of baked blueberry fruit, bramble, fresh blackberry and hints of cocoa with a ripe finish. For more information, http://www.sokolblosser.com. Lastly, we ended up at JK Carriere in Newberg, OR. The name J.K. Carriere is a contraction of Jim Prosser’s two grandfathers’ names. The wasp that features prominently on the label has, due to severe allergy, twice nearly killed him. In 1999, on the heels of cellar work for eight classic Pinot Noir producers and still working for two, Jim boot-strapped his operation and started making wine as J.K. Carriere Wines. For its first ten years the winery operated from a true 100-year-old barn, which allowed both the business and reputation to flourish. In November 2007, Jim purchased 40 acres of grape-growing land on the southeast flank of Parrett Mountain, in the Chehalem Mountains AVA. In 2009 the first vineyard blocks were planted, a new winery building was completed, and J.K. Carriere settled into its new home in the hills. My favorites: 2014 Provocateur Pinot Noir, translucent ruby red in color, the wine has a nose of fresh strawberries and cherries with a drizzle of balsamic over browned butter cake. Also, something you rarely see – a 2015 White Pinot Noir with a nose of lime flowers and melon. For more information, http://jkcarriere.com. Submitted by Dr. Diane Hayden. For more information, visit: www.wildspring.com.